Nokia, however, has taken another baby step in that direction with the invention of a cell phone that recharges itself using a unique system: It harvests ambient radio waves from the air, and turns that energy into usable power. Enough, at least, to keep a cell phone from running out of juice. While "traditional" (if there is such a thing) wireless power systems are specifically designed with a transmitter and receiver in mind, Nokia's system isn't finicky about where it gets its wireless waves. TV, radio, other mobile phone systems -- all of this stuff just bounces around the air and most of it is wasted, absorbed into the environment or scattered into the ether. Nokia picks up all the bits and pieces of these waves and uses the collected electromagnetic energy to create electrical current, then uses that to recharge the phone's battery. A huge range of frequencies can be utilized by the system (there's no other way, really, as the energy in any given wave is infinitesimal). It's the same idea that Tesla was exploring 100 years ago, just on a tiny scale. 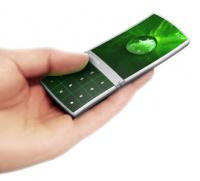 Mind you, harvesting ambient electromagnetic energy is never going to offer enough electricity to power your whole house or office, but it just might be enough to keep a cell phone alive and kicking. Currently Nokia is able to harvest all of 5 milliwatts from the air; the goal is to increase that to 20 milliwatts in the short term and 50 milliwatts down the line. That wouldn't be enough to keep the phone alive during an active call, but would be enough to slowly recharge the cell phone battery while it's in standby mode, theoretically offering infinite power -- provided you're not stuck deep underground where radio waves can't penetrate. Nokia says it hopes to commercialize the technology in three to five years.